Gorgeous wedding in the summertime in Pioneer Town. 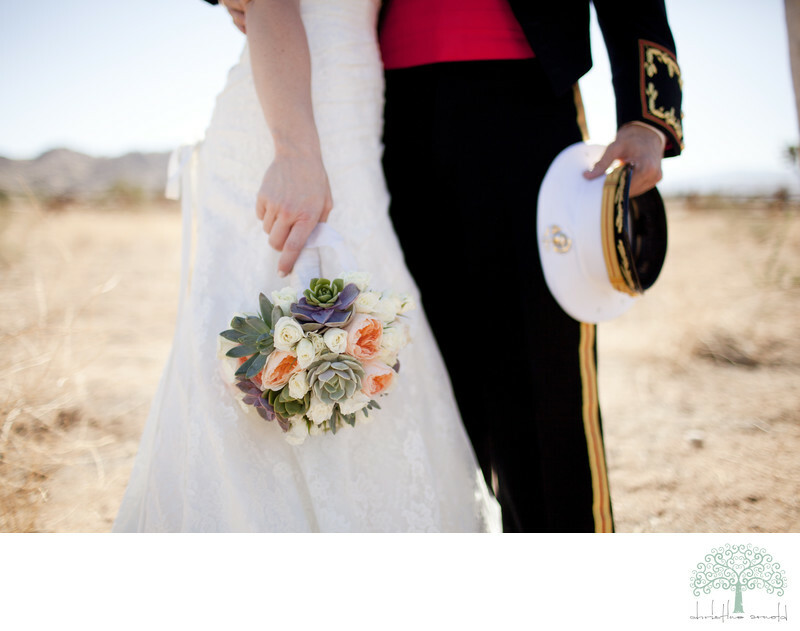 This Military couple had their wedding at Le Haute Desert Aerie. These two were just delightful and fun. Misty had been stationed in Okinawa Japan and flew in only 3 days before the wedding. She hadn't seen Rob in 2 whole years! Can you imagine planning your wedding from Japan, away from your soon to be husband and all of your family? Artisan Events and Floral Decor did an amazing job with their florals, Misty's bouquet really embraced the "desert" feel with the white tea roses, soft peach peonies and various types of desert succulents. The bridal bouquet was magnificent. Rob dressed in his Military uniform which made for a very handsome photograph of the bride and groom in the Joshua Tree desert. Location: 5505 Hakataya Dr, Pioneertown, CA 92268. Keywords: Artisan (42), Artisan Events (45), California (66), ceremony (45), nuptuals (42), Wedding (81), Wedding photography (45), Yucca Valley (3).